You’ve invested significant resources in giving your guests a great digital experience during discovery and booking. Don’t deprive them of that same great experience when they’re staying with you. 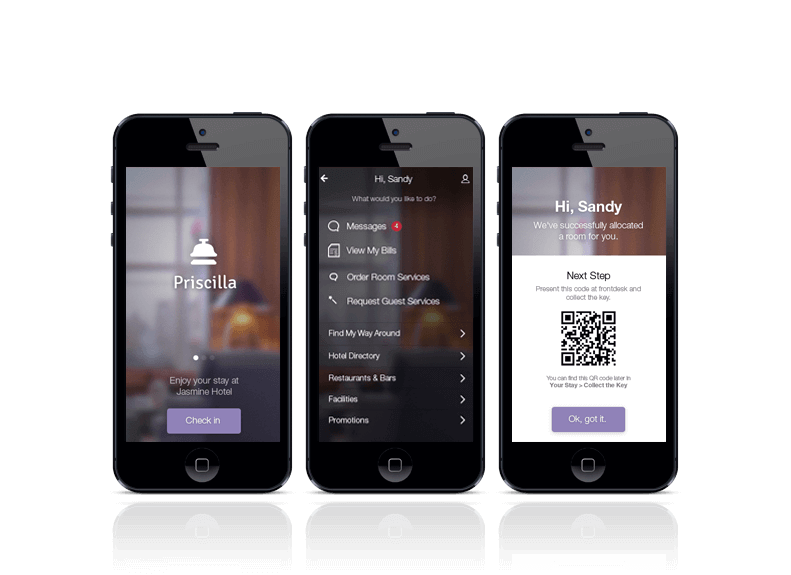 Priscilla is a fully customisable mobile app that your hotel guests will want to use because it is intuitive, convenient and functional. It empowers them to interact with you anytime, anywhere. Priscilla also has a powerful management tool (web-based console and staff app) that allows you to communicate with guests and respond to their requests promptly. Priscilla supports integration to different property management systems (PMS), point-of-sale (POS), mobile keys, room management systems (RMS), IPTV and service optimisation systems. Some partners we work with include Oracle/MICROS (OPERA); Salto; ASSA ABLOY (Vingcard); MVI; VDA and more. Download Priscilla and experience it as your guests would.